Have a look through these or please feel free to Contact Us if you have any other questions. 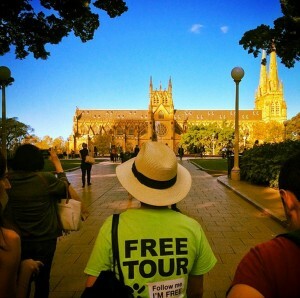 Why do we offer free tours? 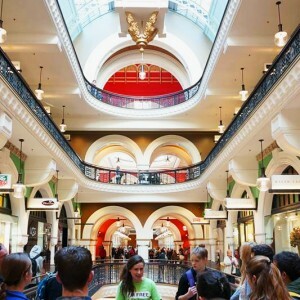 The tours are offered on a “pay what you think it’s worth” model so people of any budget are able to turn up and enjoy the tour and discover and learn about our great city regardless of your budget. We also believe you shouldn’t have to pay for the service before you have experienced it, we think you should decide how much the tour is worth when the tour is finished. No, you don’t need to book unless you are a group of 10 or more or part of a school or Tertiary education group. For bookings please contact us here or send an email to sydney@imfree.com.au. Are the tours ever cancelled? No we walk Rain, Hail or shine! Are the tours accessible for wheelchairs and or prams? The’ Sydney sights’ tour is accessible to both pram and wheelchairs. Unfortunately due to the historical nature of the rocks ‘The Rocks at 6pm’ tour is not accessible for wheelchairs. We have had plenty of prams on the Rocks at 6pm tour however, it does require carrying the pram up a few flights of stairs. We are a group of 10 or more why can’t we just show up? We make calculated predictions on the number of tour participants on every tour. A large group throws out these calculations and effects the tour quality for everyone else. So we do ask that you please contact us in advance so we can organise a private tour for you as we will not be able to accept groups of 10 or more on our regular scheduled tours. How much does it cost for a private tour? We aim to be very competitive with private tour pricing but it does depends on the length of the tour and number of participants. 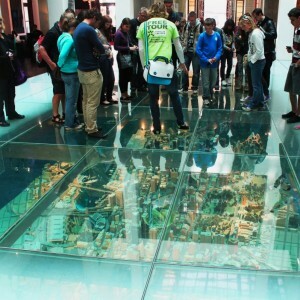 We offer tours for school groups, corporate groups and families. Please contact us and we can provide you with a quote. Can I do both the Sydney Sights tour and The Rocks at 6pm tour in one day? Yes you can. 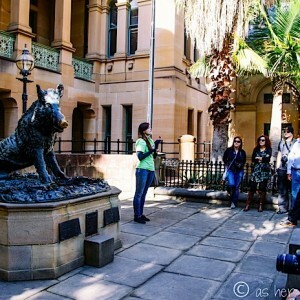 The ‘Sydney sight’s tour ends around the corner from the Start point of’ The Rocks at 6pm’ tour. There will be a 30 minute wait in between. Click here for a google maps directions. What's the difference between the 'Sydney Sights' and 'The Rocks at 6pm' tour? Is there any overlap? 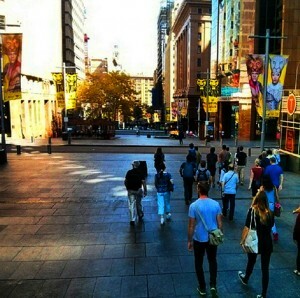 The ‘Sydney sights’ tour is an overview of Sydney’s down town area helping you get better acquainted and make the most out of your time in Sydney. ‘The Rocks at 6pm’ tour explores our oldest European settlement. 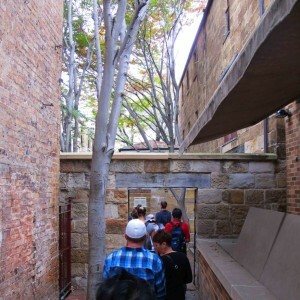 Delving into Sydney’s convict past, the murders muggings and history whilst exploring the historical lane ways, pubs and buildings. The ‘Sydney sights’ tour does enter The Rocks district very briefly stopping and exploring different sights to that of the ‘The Rocks at 6pm’ tour and only has one story that overlaps between the two tours. Is this a walking tour? Is it at a fast pace? It is a walking tour. 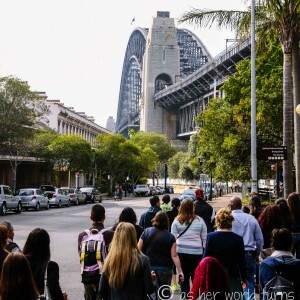 The ‘Sydney Sights’ tour is 3-3.5km (1.5 -2 miles) in total & ‘The Rocks at 6pm’ tour is 2-2.5km (1.2-1.5 miles) and we walk at a leisurely pace, stopping to speak at regular intervals along the way. Will my kids like these tours? That really depends on your child. But generally all of our tours are suitable for children. 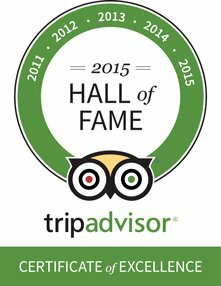 Our tours are designed to be suitable for people of all ages. Do you offer the tours in any other languages? Unfortunately we only offer tours in English at this stage. Where does the Sydney Sights tour end? The ‘Sydney sights’ tour ends near the Overseas Passenger Terminal in Circular Quay near the Opera House and Harbour Bridge. 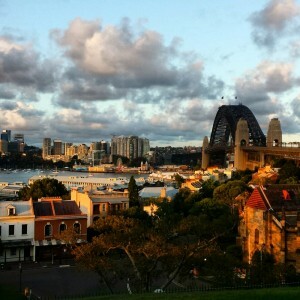 Where does the Sydney Sights Tour start? The ‘Sydney Sights’ Tour starts at Town Hall Square between Town Hall and St Andrews Cathedral on George Street. How do I get to the start of the Sydney Sights Tour? The ‘Sydney Sights’ start point is Town Hall Square (483 George St) between St Andrew’s Cathedral and Town Hall Building on George St. It is in the very centre of the CBD (central Business district) and Town Hall train Station is directly underneath our start point. All Train lines in Sydney Stop at Town Hall Station. Click here for google maps directions. Where does the Rocks at 6pm Tour start? ‘The Rocks at 6pm’ Tour starts in front (waterside) of Cadman’s Cottage in The Rocks. Where does the Rocks at 6pm Tour end? ‘The Rocks at 6pm’ tour ends on Cumberland St in the Rocks district between the Australian Hotel and the Glenmore Hotel. How do I get to the start of the Rocks at 6pm Tour?